Just before Christmas I have been shopping at H&M… and my shopping spree was so succesful! I have bought three sweaters and two dresses! Today I show you the second dress I bought back then… the leopard print dress! This entry was posted in Fashion, Winter and tagged dress, Fashion, H&M, leopard print, outfit, Winter. 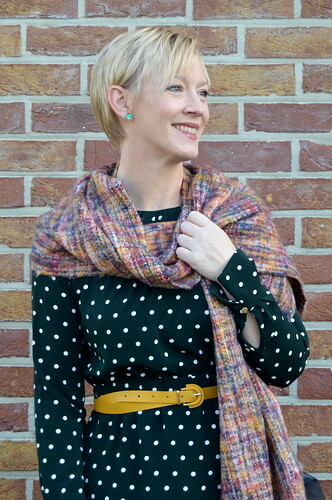 This week in the outfit of the week a lovely print… polkadots! When I saw this dress in H&M recently I immediately was drawn to it for two reasons: the lovely green colour and the polkadots! Read more about this polkadots dress! This entry was posted in Autumn, Fashion, Outfits and tagged dress, Fashion. The fifties definitely brought some stylish trends… like the pencil dress. And today’s outfitpost will take you back to those happy days in a flash! Read more about this fifties-inspired dress! This entry was posted in Autumn, Fashion, Outfits and tagged dress, Fashion, mad men, outfit. This black ‘n white summer dress… I must admit that I really have been wanting to chuck it out several times, but everytime it ends up on the ‘maybe’ pile and thus back in my wardrobe.. and every summer I wear it several times and I’m glad that I haven’t thrown it out just yet… Read more about this black ‘n white summer dress! This entry was posted in Fashion, Outfits, Summer and tagged dress, Fashion, mcgregor, outfit, outfit of the week. Last Saturday I wore my mini black ‘n white dress with a black turtleneck underneath. In today’s post, I style three black ‘n white dresses… with an orange coat, a red long cardigan and a teal fake fur. Which style do you prefer? You can vote in the poll below the images! This entry was posted in Autumn, Fashion, How to and tagged dress, Fashion, how to wear.